Men, mark your calendars now for our Guys Night 2019 with Dr. Gene Lingerfelt on Tuesday, June 18 at 7 pm. Dr. Gene Lingerfelt will share a special message that will encourage you and inspire you for greater success. This year the food will be from Babe's Chicken. Join us for a night of great fellowship, delicious food, and a life-changing message. The ticket price will be $TBD. Tickets will be available at Guest Services beginning Sunday, April 28. Don't just buy a ticket for yourself! Also buy extra tickets for men you know who need to hear a life-changing message. Please note: the last day to buy tickets will be June 9. If you’re ready for the NEXT LEVEL and you are no longer satisfied staying where you’re at, don’t miss Guys Night. Your life and the lives of the men you bring will never be the same! 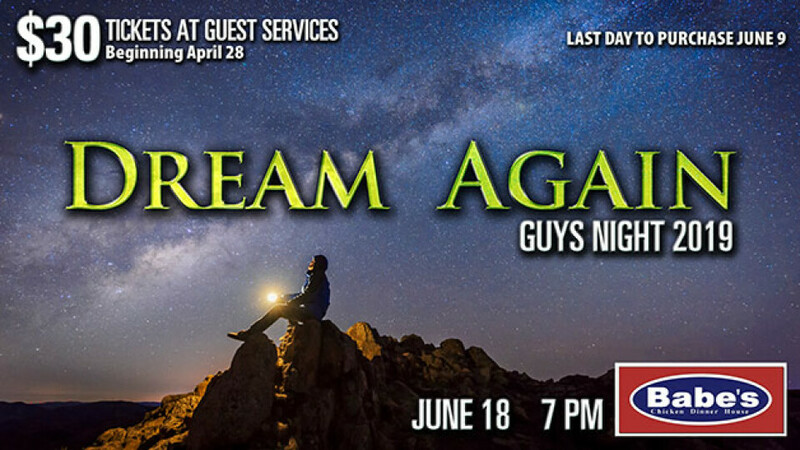 We look forward to seeing you, plus the men you invite, at Guys Night on June 18. Note: Fathers, please note that the minimum age for Guys Night is age 14.